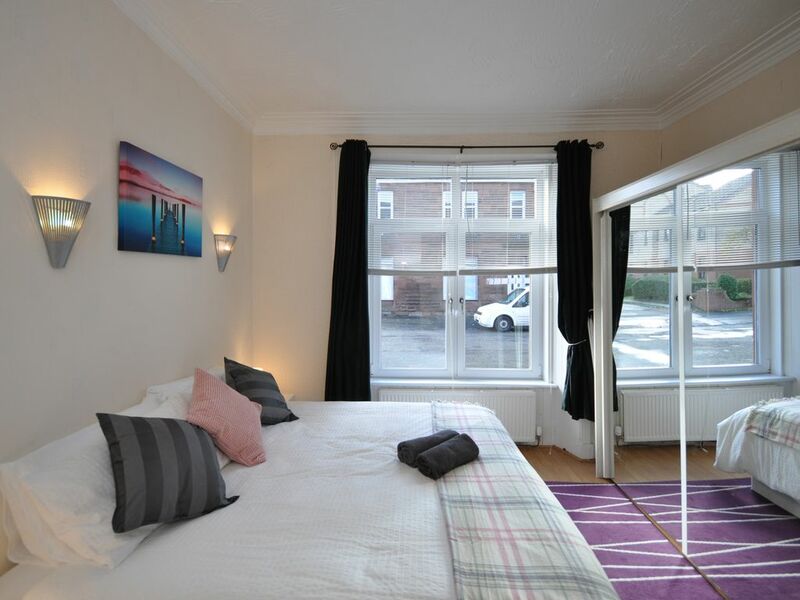 Superbly located right by Bellshill train station is this lovely 1 bedroom flat with parking availability. We've got towels, shower gel, shampoo, tea, coffee, sugar, iron, ironing board, washing machine, hair dryer, TV and broadband so you can just come in and relax. You'll have your own kitchen/diner area with most likely everything that you'll need to make yourself and your friends and family a nice meal. After that you can relax in on the coach facing a 40 inch flatscreen TV, flicking though your favourite programs. Oh and don't forget to make that cuppa tea or coffee whilst relaxing ;-) The bedroom is shower/bath ensuite so you don't have to walk far in the morning to get yourself freshened up. As the WC is separate to the bath/shower room, there is no waiting for someone to get finish their shower or bath ;-) For longer term stayers you will find it convenient that there is a washing machine in the flat too so no need to take your washing to a laundrette. If you like golf then it's only a 3 minutes drive to Bellshill Golf Club. Tesco and Morrison superstores are both a 6 minute walk away for when you need anything. Bringing the family to a fun day at M&D's Theme Park? Well that's just a 5 minute drive away. If you are the 'nature' kind of person then the Orbiton, South Calder Water and Strathclyde Loch are all within close proximity. Perfect places for walking and cycling. From Bellshill train station there are direct lines to both Glasgow (18 minutes) and Edinburgh (51 minutes). The flat can take up to 6 people if 2 people are happy to sleep on a blow up mattress. Get in touch if you want to book for 6 people. This was exactly what I needed for a stay in Glasgow! It was a tight fit for four, but all we needed was a place to sleep and this definitely provided it! It was a super cute flat and so close to the train station! The owners were great--although I never met anyone, they responded to my messages promptly and were great help! I would recommend this to a friend. Great flat!! Clean, stocked kitchen, essentials provided for kitchen & bath! Excellent location to train, bus, motorways & shops!! Owner quick to respond!! Highly recommend!! The house was smaller than I expected. Having said that it was very comfortable and convenient for all transportation and facilities. I think the owner should put a binder together with all the information on the appliances. We were very happy there and I definately would stay there again.